Sorry I forgot to take before pictures. This was a dress my middle daughter got the summer of 2013. It was donated to a church close swap. What is a clothes swap you ask. It is where you take your gently used clothes that you have out grown and trade with other people for sizes you fit into anything left over is donated to local thrift stores. 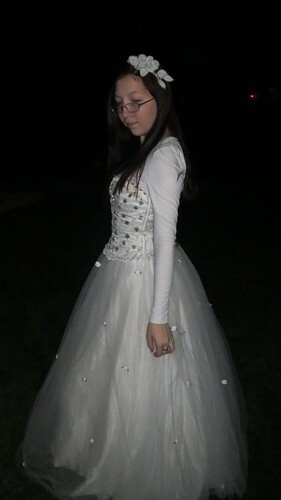 This dress was there ( actually is is a skirt and corset). I took the embellishments off of it which had been six red roses and a few (about 30) red seed beads. 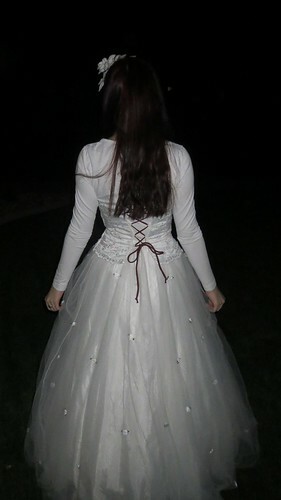 Thus leaving the dress almost totally white except for the red tie on the back. 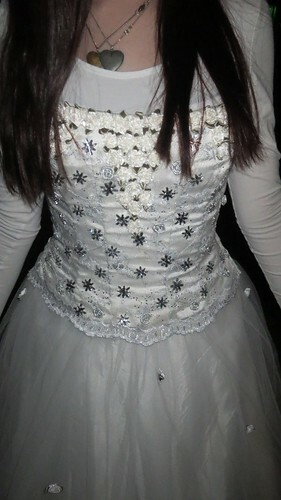 I then repaired the damage to the dress and started to sew on white roses with green accent leaves and silver roses I also sewed on white sequin snowflakes. So the dress cost nothing except thread, flowers and sequins. It still retains the original red tie on the back may change that to white not sure as it does not bother me. 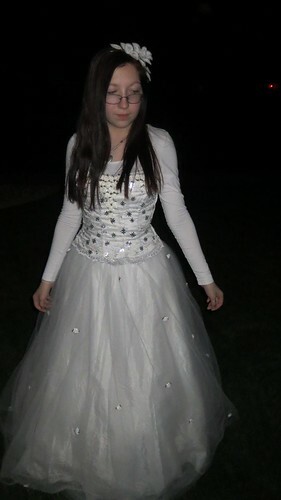 on a side note we also just used this dress in the play the wizard of Oz as the snow that fell on the poppies. 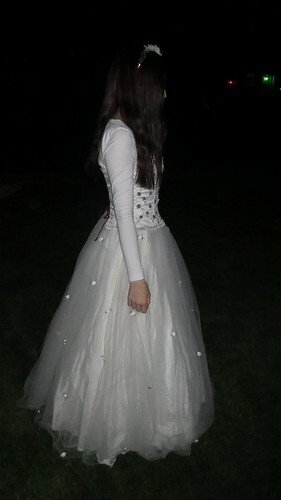 We had a ballerina dance across the stage with white disco lights going to represent snow. We were given a wedding slip the summer of 2014 which happens to work well with this outfit length wise. It too needed to be repaired where it had separated from its elastic. So yet another part I did not have to pay for except for thread. 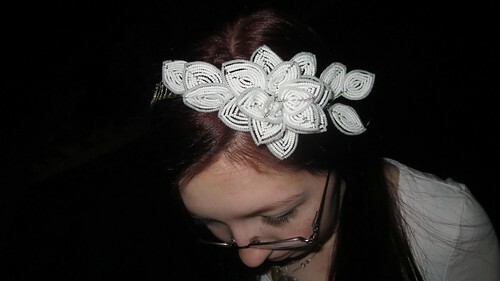 The head piece I made about a year ago just never posted on my blog. when I got finished with the dress my daughter ran to my room to grab it from my dresser. She was excited to add all the pieces together. She also added the white shirt for modesty purposes. Her hair will be fancier for the dance but it is still a few weeks away so this was just her trying it on to see how it fit.